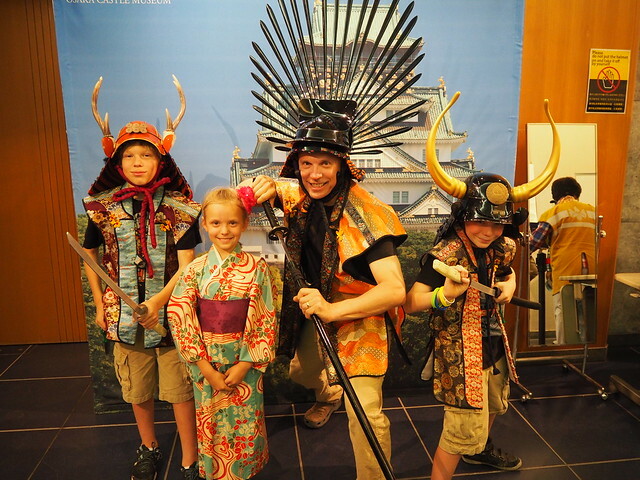 Trying on the shogun era garb in the museum. It was a beautiful spring day on Sunday and so we wanted to get outdoors and enjoy the day. 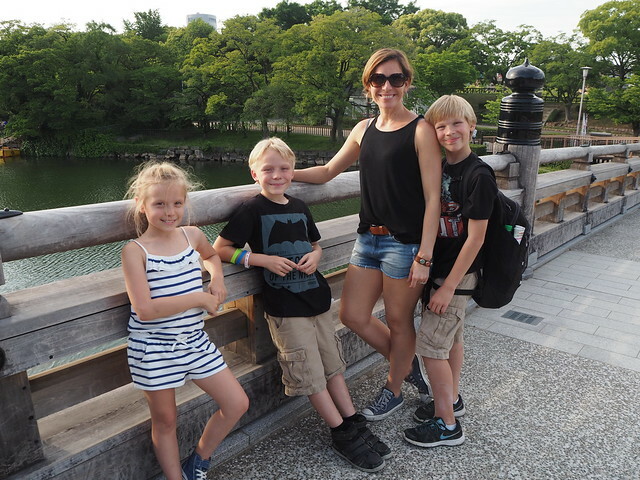 We went to see the Osaka Castle, one of the famous landmarks of the city. There is a large park around the castle and makes for a nice afternoon. We strolled along the moat and the kids played under the trees in the forests in the park. The green areas and massive moats and walls surrounding the castle are impressive. It reminded me a bit of the Kalemegdan Fortress in Belgrade. City officials have made a museum inside the castle. Admission is free for kids and 1,200 for adults. There are 8 floors of displays, which include videos describing the history of the castle, art work, models, etc. Much of the information is in English. The views from the top are also nice. The castle is located in the south central part of the city. We were fascinated with a video explaining a huge tapestry depicting the summer war of 1615. The castle was the scene of many intertribal battles and the biggest was the Tokugawa clan, the group that unified Japan and then closed it off for over 200 years, defeated the Toyotomi clan. Back in the day, being routed was not pleasant. The tapestry depicted beheadings, rapes, and women and children fleeing across the moats. The poor civilians upon reaching “safety” were set upon by robbers and had everything taken from them. The tapestry ends with the the survivors crawling to Kyoto on the old road. I can see why the Japanese at the time welcomed the Tokugawa peace. Having to constantly be worried about attack from various clans must have been a tough way to live. 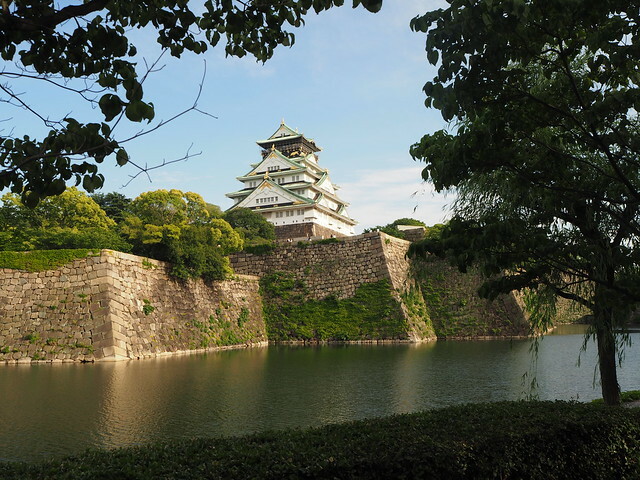 The castle was destroyed a couple of times after lightning strikes and finally in 1868, during the Meiji Restoration and the end of the feudal era, the fort was destroyed during the civil conflicts of the time. I recommend a day out at the castle. The city also organizes lighting shows are certain times of the year in the evenings. I will definitely go back after I learn a bit more about Japanese history. It is strange that 400 years later the scene of so much violence and death is a tourist attraction. 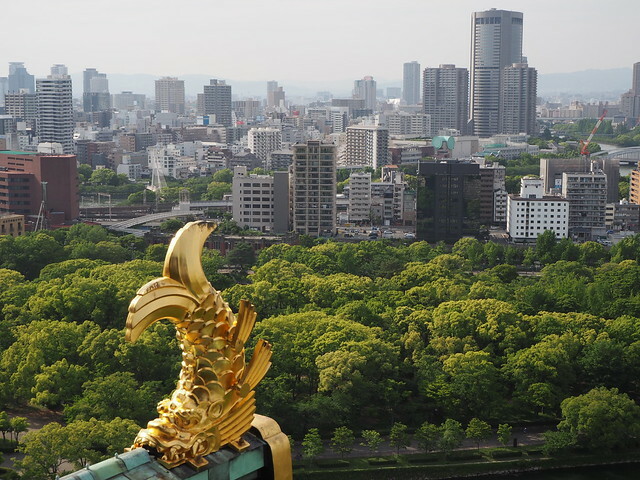 I enjoyed your post on Osaka Castle. I just sent Peter Heimer an email, hoping he could introduce us. Thank you for your time, and a great blog.